Chris Crosby, CEO and founder of Compass Datacenters, likes to try new things. For a while now, his company has been promising to deliver a data center in six months from initial ground breaking. He is so confident in this ability he has pledged to pay customers $100,000 if Compass doesn’t deliver. 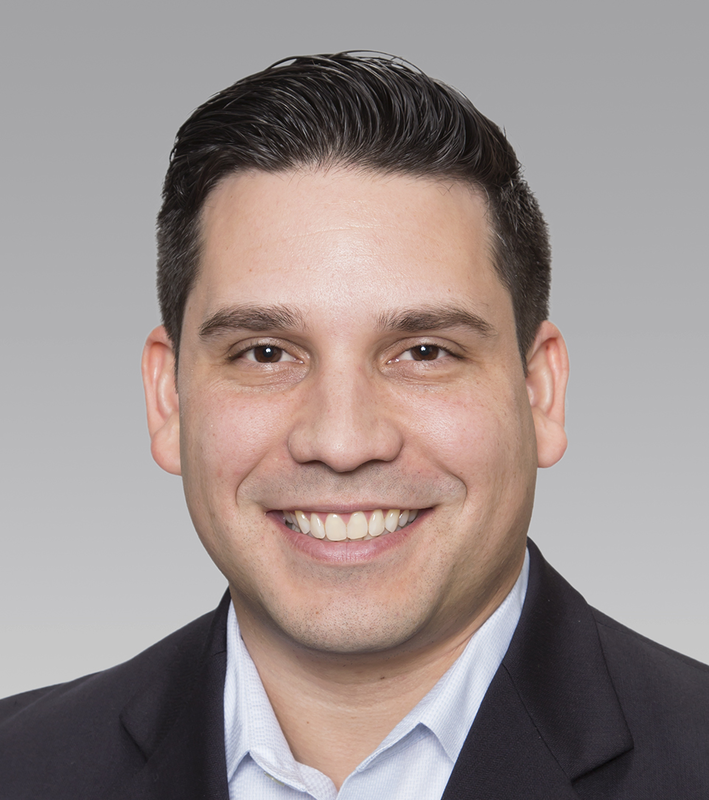 As to the improvements, Jose Ruiz, vice president of operations at Compass Datacenters and one of the company’s first employees, said they are crucial. Data center operators are asking for more versatility, more adaptability, and support for high increased equipment densities in the raised floor space. Ruiz offered the following example: one of the problems engineers at Compass are being asked to solve is how to power and cool 2.4 megawatts of computing equipment in the same amount of floor space as the current 1.2-megawatt design. Turns out this introduces a structural challenge. But the real challenge is dropping the PUE to somewhere between 1.25 and 1.10. Getting that kind of efficiency requires a significant shift in design philosophy. 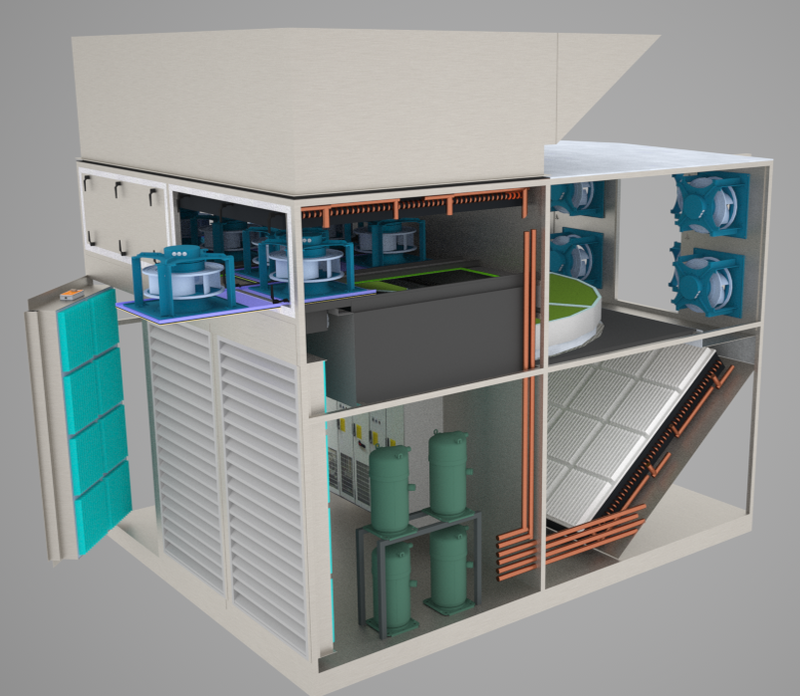 In an attempt to solve both challenges, Compass engineers have been working with experts at Air Enterprises of Akron, Ohio, North America’s licensed dealer of KyotoCooling technology. KyotoCooling is a relatively new product, first marketed in 2006 by KyotoCooling BV of Amersfoort, Netherlands. Cloudsite Intelligent Data Centers acquired controlling interest of KyotoCooling BV in 2013. Today, KyotoCooling systems have been installed in 75 locations around the world. Why are Compass engineers interested in KyotoCooling? The technology makes the challenges mentioned above — the requirements for Crosby’s improvements — disappear. 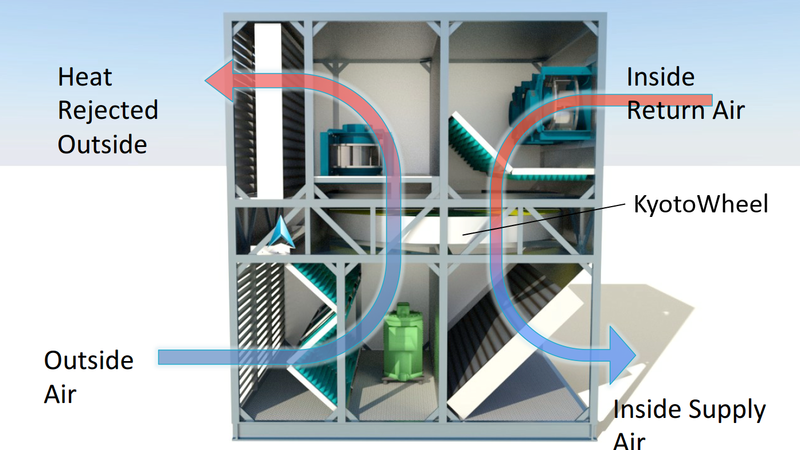 KyotoCooling systems also meet the Compass modularity test, and the units can be installed on-grade, inside the facility, or on the rooftop. The heat transfer efficiency of this technology is approaching 90 percent while aiming to use 75 percent to 90 percent less power, which in turn reduces carbon dioxide emissions. The essential component of KyotoCooling is the KyotoWheel, a sensible heat wheel made from honeycombed aluminum. The operative word is sensible: the transfer of energy, heat in this case, from one airstream to another. 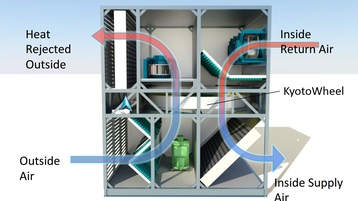 Heated air from the data center enters the inside-air plenum and passes through the continuously rotating KyotoWheel. The wheel’s aluminum matrix absorbs the heat, and the now-cool air returns to the raised-floor space. As the heated portion of the KyotoWheel rotates to the outside air plenum side of the enclosure, cooler outside air, pulled into the plenum by fans, passes through the KyotoWheel, absorbing heat. The not hot air is funneled out of the KyotoCooling assembly into the atmosphere. 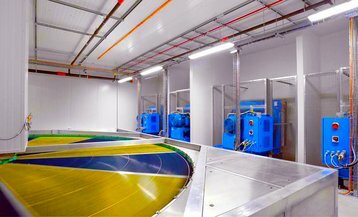 The image to the right depicts the 400-kilowatt KyotoCooling system Compass Datacenters intends to use. Many variables, including location and time of year, determine whether free-cooling alone is sufficient. When conditions are unfavorable for free cooling, an auxiliary cooling system in the outside air plenum automatically kicks in. How the two systems coordinate might be best explained using an example. A data center requires a cooling temperature of 72 degrees F. If the outside air temperature is less than 67 degrees F, the KyotoWheel alone will provide 100 percent of the cooling. If the outside temperature is between 67 degrees F and 90 degrees F, the auxiliary cooling system will lower the outside air temperature to maintain the cooling temperature of 72 degrees F. Above 90 degrees F, the auxiliary cooling system will be the main source of cooling for the KyotoWheel.